Wow, it’s July already! And nearly half way through already…geesh. Alright, so I’ve been a little MIA. LOTS of things happening here at Pear Tree Greetings, but more to come on that in the next few weeks. Did you have a good 4th of July? Ours was fairly uneventful…but that’s okay. Lake, fireworks, zoo, relaxation…perfect if you ask me. 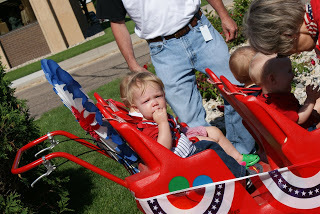 Here is my little man in his daycare parade last week…as you can see…he wasn’t exactly LOVING it. But hey, he was looking into the sun. ← PreviousWhere does the time go?